Edging adds a wonderful dimension to stone tops and amplifies their natural beauty. Depending upon which edge profile is selected, there may be an additional cost incurred. We include 4cm standard edges in all estimates. In addition to the edge details showcased below, we can do custom one-of-a-kind edge profiles upon request. Do use mats under hot dishes or cookware. Do use place mats under china, ceramics, silver or other objects that may scratch your stone's surface. Do clean surfaces by wiping with clean water or spraying with StoneTech Professional Revitalizer cleaner, then wiping dry with a clean cloth. Do not use vinegar, bleach, ammonia or other general-purpose cleaners. Do not use abrasive cleaners such as dry cleansers or soft cleansers. Do not use alkaline cleaners, not specifically formulated for natural stone. For an accurate estimate, we would need your personal information including name, address, phone number, fax number and/or email address. We would also need specific dimensions of the areas you want quoted, along with edge type (see edge profiles), backsplash height (if any), sink type (top mount versus undermount) and name of material (if decided). If you don't know the specifics, we typically quote category I granite with a standard edge profile. You can fax, email, or simply bring in the information. When you come in for an estimate, please make sure to bring a sample of the cabinet, the flooring, and paint so our showroom staff can assist you in picking the right color. You can. Granite is extremely hard and can withstand even the sharpest knives. It's not a good thing for your knives though. They can get dull in as little as one use. We recommend using a wooden or plastic cutting board. Like any solid surface, high impact blows can harm granite. Because of its crystalline structure, it can chip if subjected to sharp tipped hard objects. Unsealed, granite can absorb stains such as oil, which can ultimately cause dark spots or discoloration. Heat from pots and pans or burning liquids will not affect granite under normal circumstances. Unless otherwise requested, installation is always included in our pricing. We provide all the templating, fabrication, sealing, delivery, and installation for our countertops. If it is a small project and you want to attempt the templating and installation yourself, typically for a single vanity top or table top, please specify, and we will price accordingly. My little sample of granite has pits on the surface, will I have these on my kitchen counters? Granite, which is crystalline in its structure, often has tiny pits or spaces between the various mineral crystals. It's hard to see them on a larger piece because the overall appearance is polished and mirror-like. Granite sometimes has natural fissures as well, which may look like cracks, but are not structural defects and are a naturally occurring result of the immense heat and pressure which formed the granite eons ago. These characteristics are part of the natural beauty of stone and will not impair the function or durability of the material. A product of nature should not be expected to look man-made. Granite is formed by extreme heat combined with pressure occurring beneath the earths crust. It is extremely unlikely that a granite countertop would crack or discolor when exposed to a hot pan. It is very hard to damage granite. If any damage occurs it can usually be fixed with a mixture of epoxy and ground up chips of granite. How are the edges of the granite finished? Using the specific diamond router bit, the edges are cut. The edges are then polished using eight different diamond polishing discs. 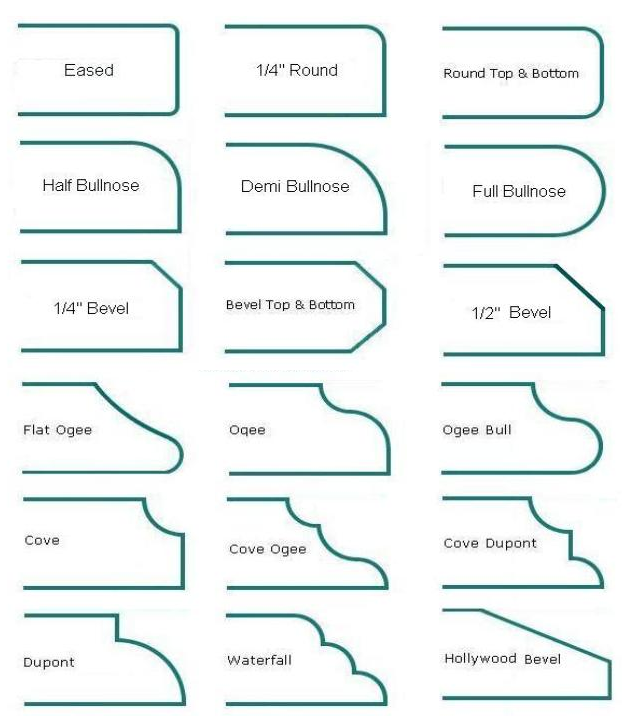 Edge Treatments A variety of edge treatments are available, including Straight, Bullnose, Half-Bullnose, Demi are just to name a few. How do I determine the color of granite that I want to use on my project? Our staff is highly experienced and can help you narrow down the choices that look best with your decor. Please visit our facility and bring a sample of the cabinet, the flooring, and paint. How does granite compare to other products as far as durability and hardness? Since hardness is often a factor in how a product is suitable for a particular project, it becomes necessary to determine how hard a product actually is. The scale which is used is the Measurement of Hardness Scale (MOHS) scale. The object of the MOHS scale is to measure stone resistance to hardness. When sediment and grit are harder than the surface, they will scratch and harm the stone. The harder the stone, the more resistant it is to abrasion. On a scale of 1-10 on the MOHS scale, granite is around 7.5. Because granite is a natural material and is mined from the quarry in blocks usually no more than 10 feet long, you will most likely end up with seams. Our goal is to have as few seams as possible. Some granite color will show seams more than others. Please stop by our showroom to see samples of our seams. We promise we will try our best to make them as inconspicuous as possible. Most natural stones are porous to some degree. Granite has very little porosity. Most colors will never show any moisture. A few colors may show some moisture if exposed for a period of time. For example, a puddle of water left on the counter for 30 minutes for some colors, may show a dark spot when the water is wiped away. This spot will then dry up and no evidence will show. Only a few colors demonstrate this trait. Our installers will seal the countertops after they are installed. We recommend sealing the countertops every year. Please call and request a clean and seal appointment. Granite can be cleaned with any mild cleaner such as warm water with dish soap. You can also purchase a daily granite cleaner. The cost of granite counters can vary a lot depending on the color, edge profile and custom shapes used in the layout. Our pricing is very competitive and hard to surpass when you consider the total value of our services.